I just feel so tired today, and slight headache. So I call for a sick leave. But I will get sicker if I just stay at home without doing anything. So decided to go to Ikano Power Centre to window shop at the pet shop (perhaps buy a few water plants for my aquarium). I don’t really know what happen, I feel the urge of going to Ikea. Maybe after finding out that Ikea is on sales now, and the fact that it is working hour where there are not many people inside Ikea. I will try to avoid coming during weekend at the time like this, where you can hardly have peace browsing through the items there. I started to collect a number of books nowadays, from computer books, to aquarium related books, to cat related books, game strategies and also various computer/auto magazines that I bought. I think, it would be nice to have a bookcase for this. 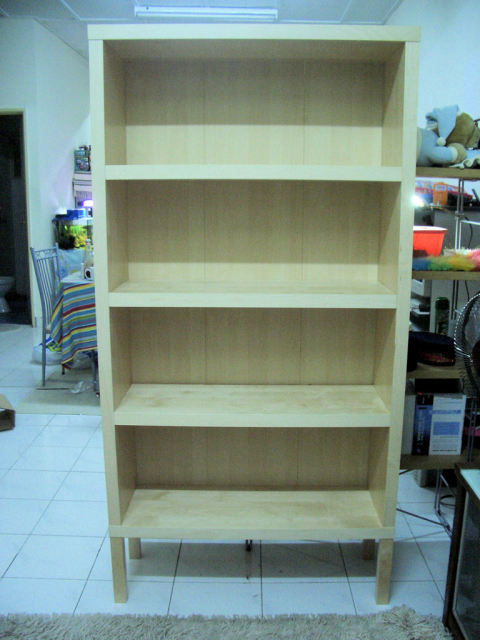 So, I saw this Agerum bookcase, with the catalogue price tag of RM299. But due to the Ikea is on sales, the price is knocked down to RM199. I’m excited! This is a must get for today then. Bought a few other small things as well, mainly kitchen utensil – plate, bowl, scissors, onion chopper, chopping board, kitchen timer etc. 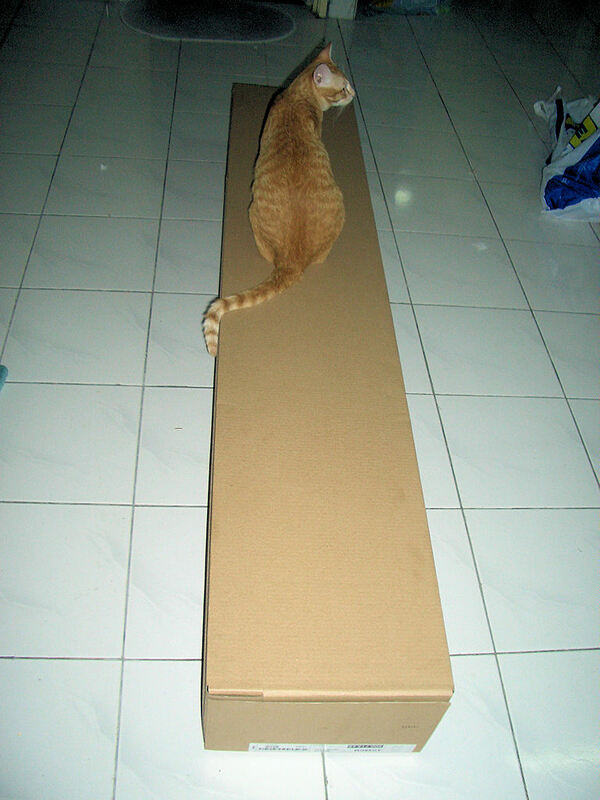 As always, Oyen got to be the model of every new thing that I bought. It is just a cat’s nature to be curious if there is something new in the house. So as usual, Oyen starts to sniff and jump over the box. And here are all the pieces that need to be assembled together. 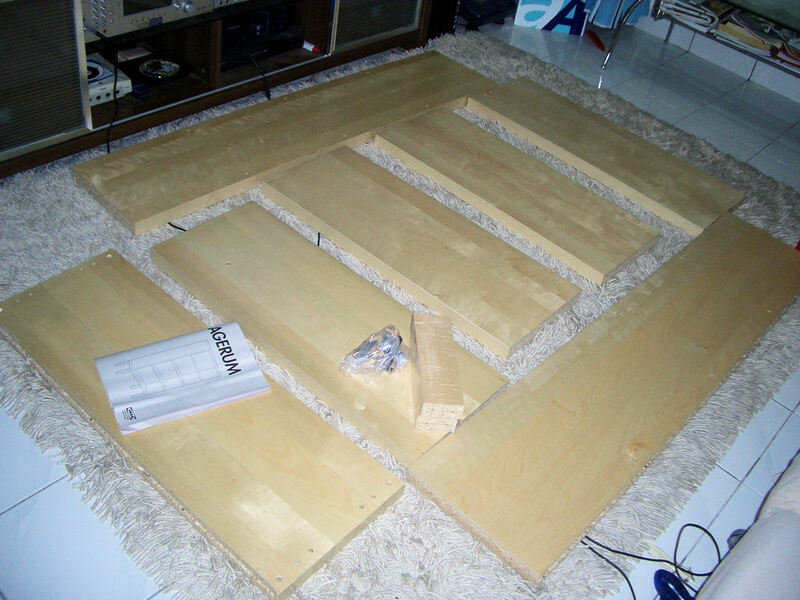 One thing that I like about Ikea furnitures – you don’t have to be carpenter to fix thing up. 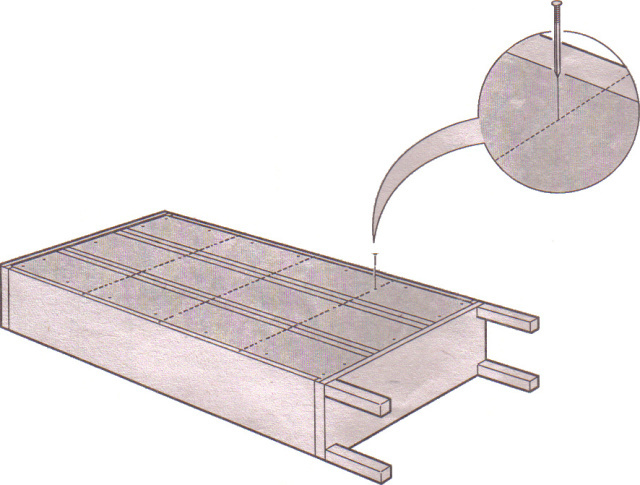 And the manual is very clear on the step by step that you have to follow to get fixing done. And here is how the finished product looks like. This sure looks like a very sturdy bookcase. 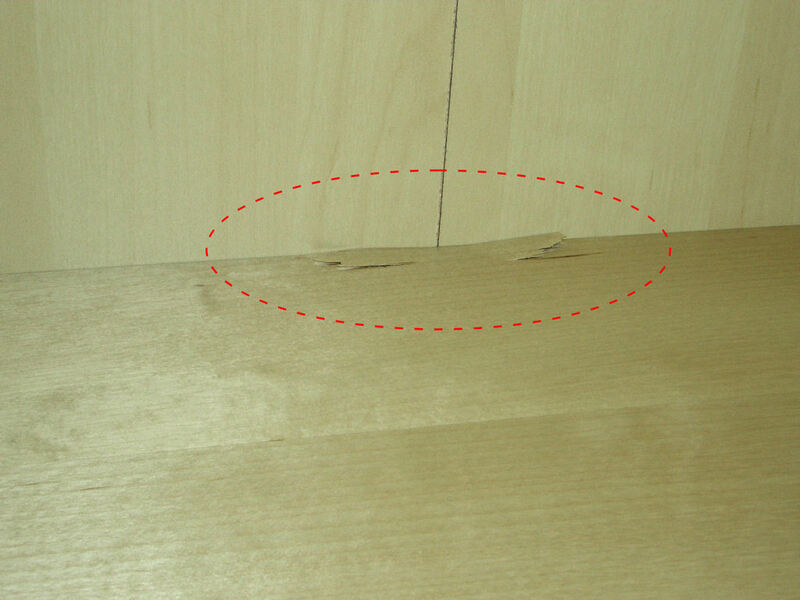 Actually, there’s a bit accident happened during the nailing process. The nail line supposed to be measured precisely, and marked with pencil. I did that, and didn’t know what went wrong, my nail line a bit off where it supposed to be. As a result, this is what happened. Arghhh.. There’s a defect with my bookcase already. imran, shout box tu boleh apply lagi tak..? rasa macam nak letak kat blog la..
sikit jer tu.. alaskan jer dgn kain..mesti tak nampak..tapi kenapa kolornyer tak sama..
hi, imran, wahhh bestlah almari tu, besar dan nampak kukuh. seriously bestlah. amirah: hehe… tapi besok2 klu nak pindah, camnerlah agaknya. w'salam kak ema. oh. saya masih ingat akak. tak sangka leh terjumpa kat sini plak. hehe..
yeap. really nice to meet so many of my future neighbors kat blog ni dan dekat Casa Idaman Facebook page.